Elegant, Personalized Style That Lasts. With luxury vinyl flooring, we can work with your vision, complement your furnishings, or expand and improve the mood of your home. You may think that our team of flooring artisans are magicians once you see how realistic luxury vinyl flooring looks in your home. With a herringbone wood plank effect, luxury vinyl planks can visually widen a room or lengthen a hallway. The entrance of our Campbell showroom shows a custom-cut and glued luxury vinyl planks in a unique, striking herringbone pattern. At Slaughterbeck Floors, our experience is unmatched by other flooring stores in the San Jose area, and that experience will be apparent when you plan your project with our staff and enjoy your new floors for years to come. 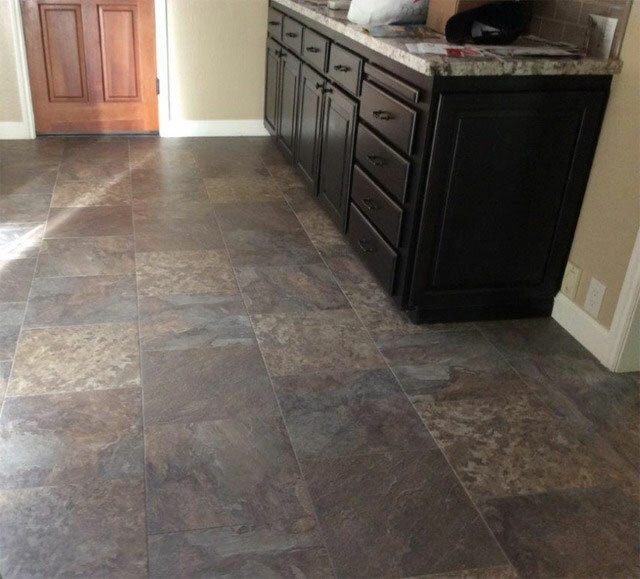 Vinyl flooring has traditionally meant “roll goods” – flooring that is pliable and comes in a roll, and is glued down or placed by floating installation. With this installation method, the roll goods (carpet, sheet vinyl) are simply laid onto the subfloor with no glue, nails, or other fasteners. Luxury vinyl flooring is the contemporary enhancement of traditional roll vinyl flooring and is available in two variations: luxury vinyl planks (LVP) and luxury vinyl tiles (LVT). Vinyl planks realistically mimic hardwood floors in both appearance and texture. Meanwhile, vinyl tiles beautifully replicate the appearance of ceramic, stone or marble tiles. 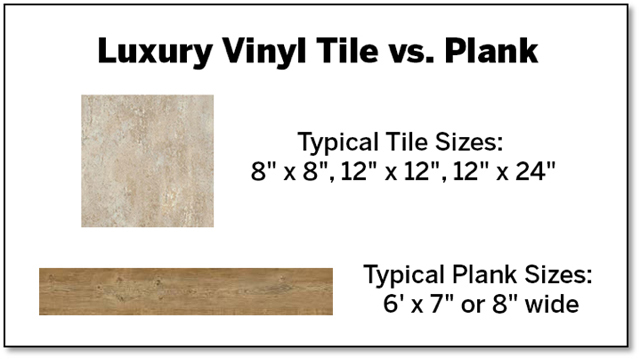 Both vinyl planks and tiles are more rigid than roll vinyl. The planks can either be installed with glue or by click-together installation, also known as click-and-float, and the vinyl tiles can be glued down. Both LVP and LVT floors are much more durable and easier to maintain than the floor they mimic. Many are water-resistant and some types are even completely waterproof! Many LVTs are groutable. 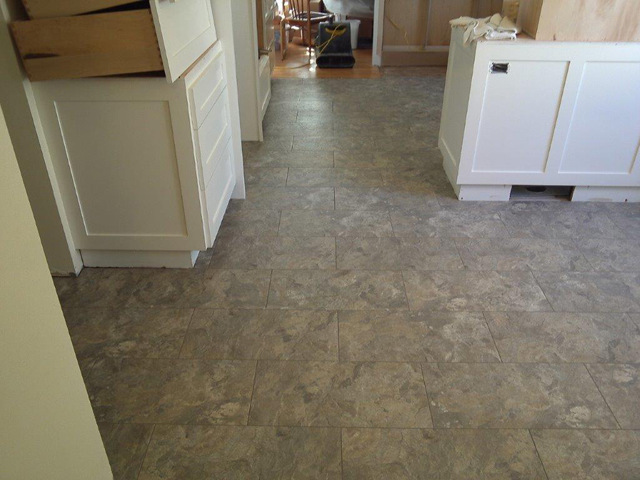 The grout will enhance the look of your floor and create a realistic impression of real tile flooring. LVP and LVT flooring is a modern improvement of vinyl floors. 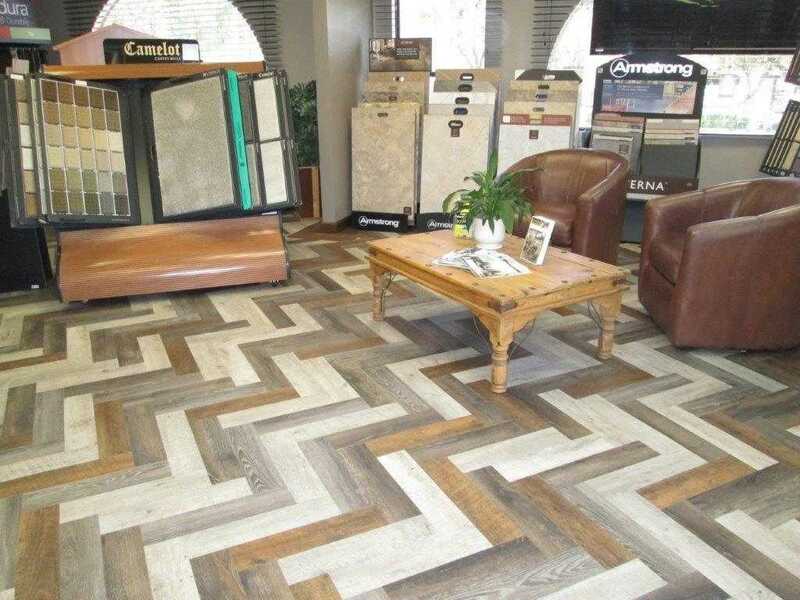 Both types allow Slaughterbeck’s designers and flooring craftsmen to replicate the appearance of other flooring ranging from wood flooring to ceramic or stone tile. Additionally, some luxury vinyl flooring is able to imitate not only the appearance, but also the texture. Grandma’s vinyl floors fail to offer this advantage. LVPs and LVTs are available at a much lower cost than actual hardwood floors and tiles. LVP and LVT floors are uniquely customizable, allowing the ability to create unique art flooring or patterns of flooring that enhance the design and interior décor of your home. Though often used for commercial flooring for its durability and tolerance of high traffic, LVPs and LVTs are rising in popularity in residential flooring. Their ability to mimic other types of floors in a wide variety of patterns make luxury vinyl flooring desirable for both commercial and residential needs. Luxury vinyl flooring is not only one of our most aesthetically desirable floorings, it is also one of the most durable flooring types on the market – in fact, some LVPs and LVTs come with a lifetime warranty for residential use. Its unique composition allows it to resist mold, mildew, and moisture, which makes them ideal for areas of the home where water dripping may be an issue, such as high moisture areas like kitchens, bathrooms, laundry rooms. 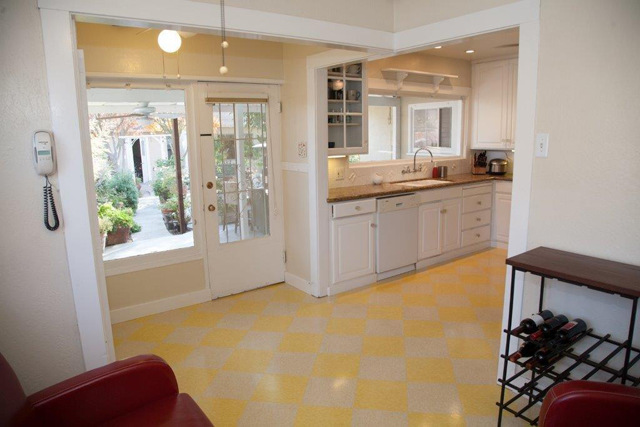 All types of vinyl flooring share certain desirable characteristics. Aside from being able to mimic other types of flooring, vinyl is springy – it has flexibility and resilience. It’s durable, easy to clean, and lasts well in both high-traffic areas and the even more wear-intensive “pivot points” (where people and pets pivot to change direction). “VCT” is a finished flooring material used primarily in commercial and institutional applications. They are composed of colored polyvinyl chloride (PVC) chips formed into solid sheets of varying thicknesses (1/8″ is most common) by heat and pressure. The vinyl floor tiles are cut into modular shapes such 12″ x 12″ squares or 12″ x 24″ rectangles. In installation the floor tiles or sheet flooring are applied to a smooth, leveled sub-floor using a specially formulated vinyl adhesive or tile mastic that remains pliable. In commercial applications some tiles are typically waxed and buffed using special materials and equipment. Our company installed over 450 San Jose hardwood floors last year, using wood ranging from red oak to Brazilian Cherry. We will happily either lay down straight plank flooring, or accommodate your dreams with a custom wood floor. Our designers like dreams and our craftsmen are the best in town to provide perfect work-whether you want a custom floor or traditional layout. Cork is well-known for being sound-absorbent and comfortable to walk on. Less commonly known is that cork has an extremely strong cellular structure, which locks bacteria and even moisture out of the individual cells, preventing both the growth of bacteria and the growth of mold and other organisms that need moisture. Therefore, while cork flooring can be varnished if desired, it is extremely healthy flooring in its natural state. Slaughterbeck Floors carries a full range from wool carpeting (natural luxury) to nylon carpet (widely used for its durability and resiliency). Also available is polyester (good color rendition, soft, and less expensive than nylon) and Olefin (polypopylene, fast gaining popularity because of its resistance to stains, fading, and moisture). Laminates are built of a hard laminate layer over foam sheeting – a “floating floor” – and are available in a huge variety of styles, appearances, and textures. Less expensive than hardwood, laminate flooring has additional cost savings because the foam sheeting reduces the need for pre-installation floor preparation. Laminates are quite hard and offer superior scratch resistance. They are an ideal choice for high-traffic areas, particularly areas that are part of a home’s overall interior decorating theme.